How are women in astronomy being celebrated? 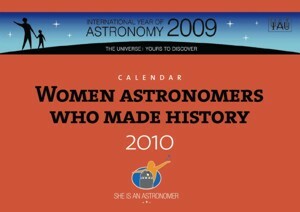 Romanian astronomers handed out IYA2009 badges on 8 March to women to celebrate International Women’s Day. Turkish astronomers visited schools to show the children that astronomers are female too. America held camps for girl scouts and photographers. Korea included a female astronomer in their ‘meet an astronomer in the classroom’ programme. 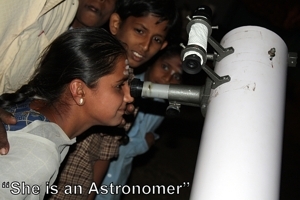 India included three female astronomers in their film on astronomy to be sent to schools. Saudi Arabia organised lectures describing the universe, especially for women. Tunisia held a meeting on 7 March with lectures by women scientists. Australia put on a production of the play 'Razing Hypatia' by Jane Montgomery Griffiths. 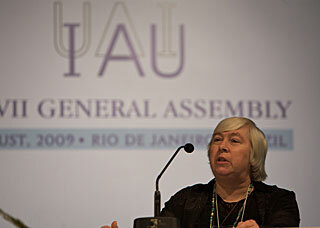 The International Astronomical Union (IAU) passed a resolution supporting women in astronomy. Germany, Australia and Mexico are holding exhibitions celebrating female astronomers. Italy, Belgium, Ireland and the UK held meetings featuring female astronomer speakers. America held a workshop on inspiring young women to stay in astronomy. Russia held a meeting to celebrate the work of their senior female scientists. Australia is launching a book about Ruby Payne-Scott, a pioneering radio astronomer.